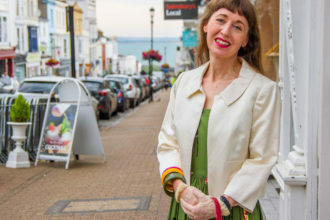 Regular readers of Wight Catwalk (yes, you – practising applying glitter eyeliner while listening to Professor Jimmy Edwards on BBC Radio 4 Extra [that’s possibly just me then]), will have noticed there there is a certain theme to the ‘Shop the Look’ items. Yup, they are nearly all holographic! Clearly someone with a magpie-like brain is curating this Archive of Shiny Things. Clearly someone who knows a shiny thing when she sees it. 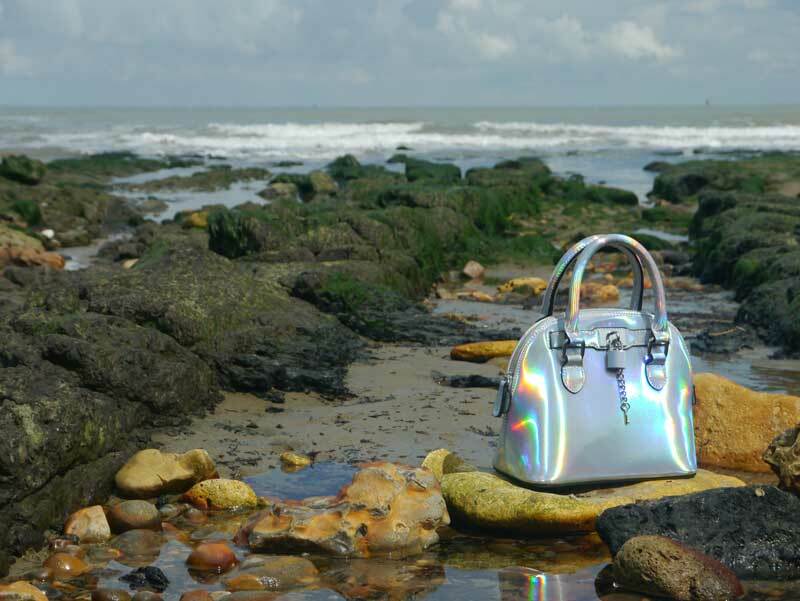 Some of the shiny things that drop through the Wight Catwalk letterbox are there just to be stroked and purred over, but others are for dazzling the people outside with. People on the Isle of Wight. Someone* once said that any woman who carried a satchel is a #SatchelWanker. And she was probably right. 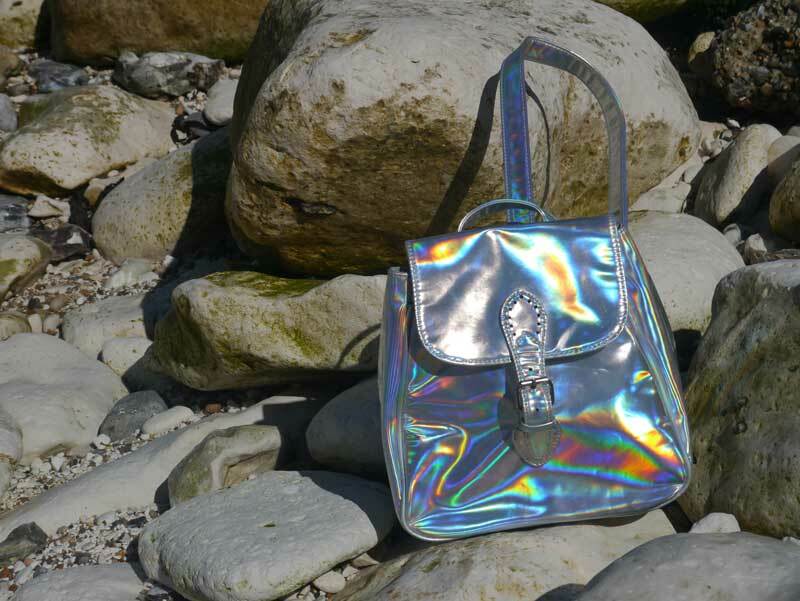 There is certainly a glut of these buckled flap bags on the market – from the ludicrously expensive Cambridge Satchel Company‘s nostalgic leather carriers to Cath Kidston‘s twee floral and polka dot numbers. 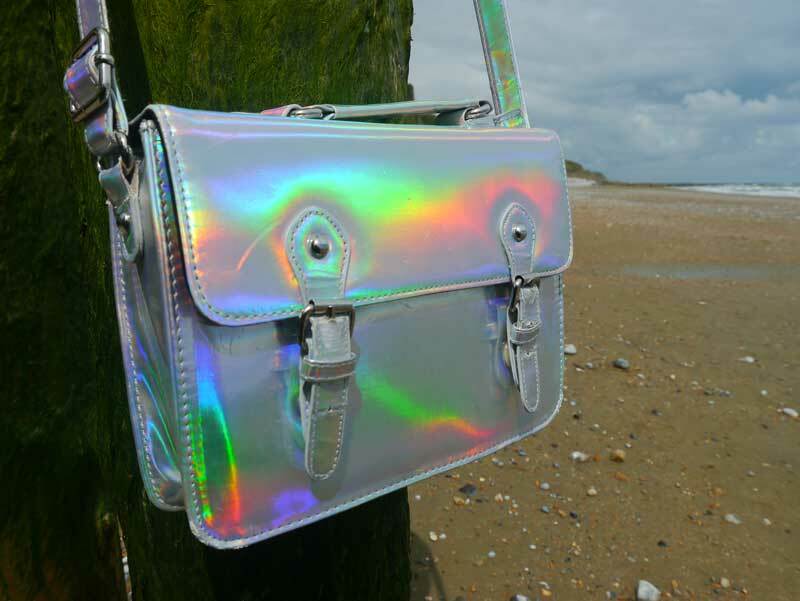 So people, move away from the heritage leather and webbing-strapped cross-body bags and stare in awe at the shiny. The satchel rocks; it’s got an adjustable strap with enough length to go from armpit-nestling to hip-brushing. There are a couple of inside pockets – snug, but useful. 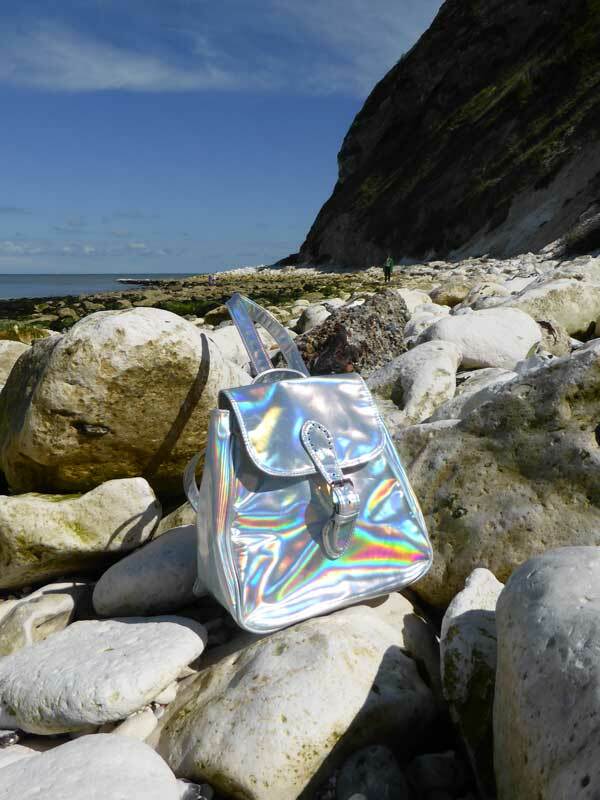 It’s pretty compact; there’s enough room for camera, phone, keys, mints and old tissues, but if you have a vast wallet or massive sunnies then you might want to step it up a gear. 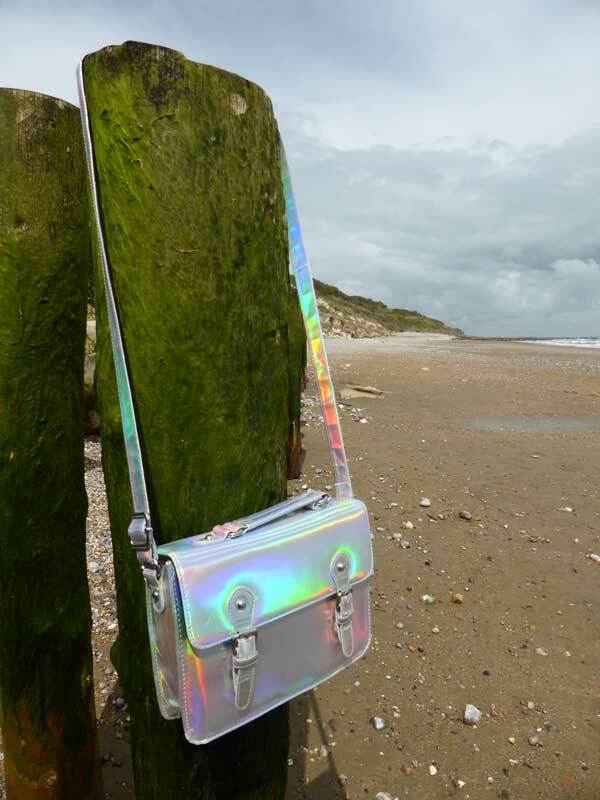 Satchel from ASOS, £28. 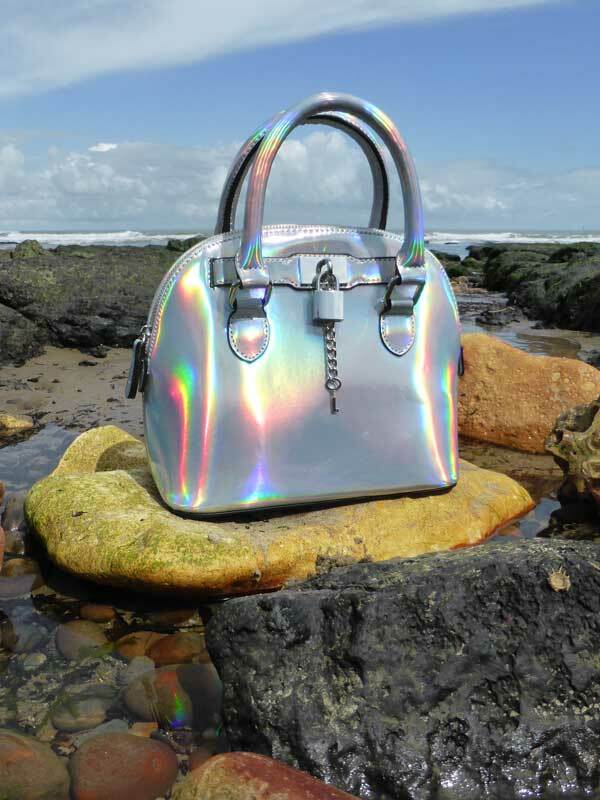 I like to kid myself that when I’m swinging this bag insouciantly on Ryde Leisure Strip that I am actually in a cobbled piazza wearing an Audrey Hepburn headscarf with George Clooney waiting on a balcony with a cup of that unsustainable coffee that he peddles. With its classic bowling bag shape and dangling dinky (but pointless) working padlock and key, it’s a good bag for toting the above essentials plus a few extras like a bottle of tap water (filled from your own tap, enabling you to stick two fingers at Mr C and his resource-depleting over-packaged Nespresso). Bowling bag from ASOS, £35. Still not enough room for all of your bits and bobs? You probably need to have a sort out! 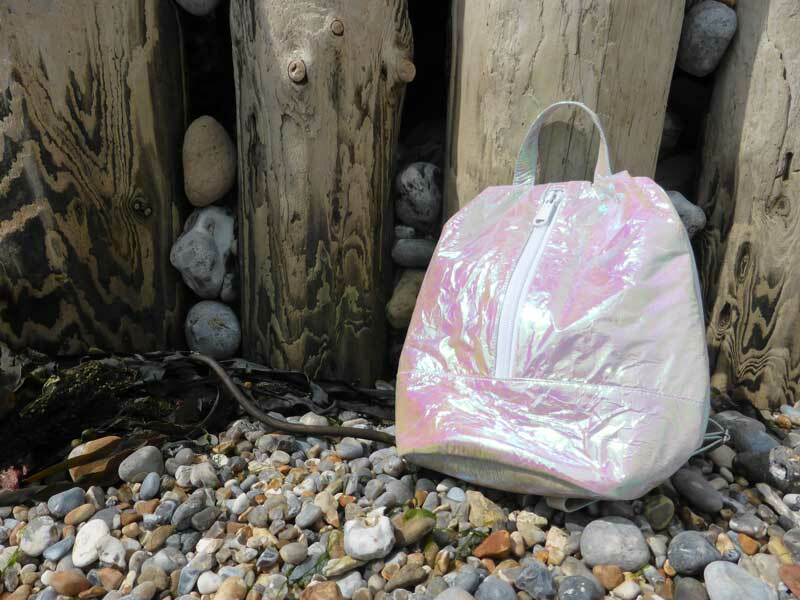 Or you can shove all your old lipsticks and that tatty Filofax in this crinkly space rucksack. The roomy but slightly inaccessible interior can hold enough for a weekend away (if you travel light!). Expect constant crunching noises from the crinkly fabric as you sashay around the streets of Newport. Rucksack from Motel Rocks, £40. 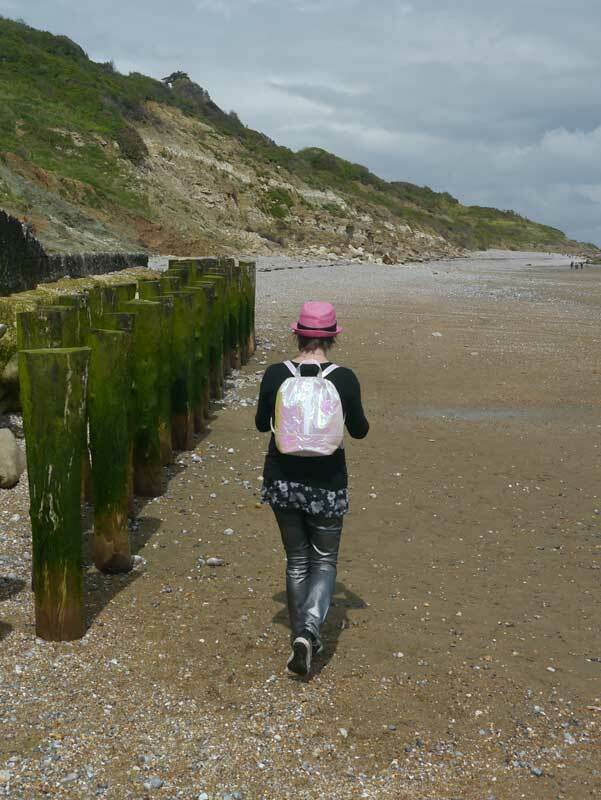 Probably the most practical (no audible crinkling, or tricky access) is this rucksack from Motel Rocks. With buckle-adjustable staps, a top loop and inside zipped pocket, it’s roomy and practical. My only complaint is that (like the satchel above) the ‘buckle’ fastenings are actually a front for a magnetic clasp. Why oh why do manufacturers take the trouble to stitch on a perfectly usable buckle then disable it with a magnet. A tube of Araldite from Hursts has resolved this issue on all of my bags; the magnet is glued shut and the buckle can fulfil its original purpose. Rucksack from Motel Rocks, £30. Next articleHit me with your laserbeam! Sally has a fabulous curated style; blending vintage with charity shop finds.